The three members of the AVL-3 series provide peak output amplitudes of 450V with 1 ns rise time (Model AVL-3AH-C), 300 V with 600 ps rise time (Model AVL-3A-C), and 150 V with 500 ps rise time (Model AVL-3B-C). Output pulse widths for all models are variable using one-turn controls from 5 to 100 ns. 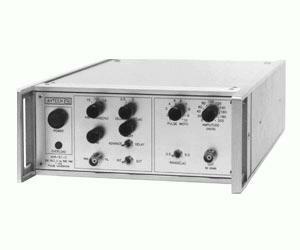 The pulse repetition frequency for all models is variable from 50 Hz to 5 kHz using the internal clock oscillator that is controlled by a front-panel one-turn control. A delay control and a sync output are provided for sampling scope triggering purposes. The units can also be triggered externally using a TTL-level pulse.